Be careful around the antenna when removing snow from the roof. Otherwise the antenna could be damaged. 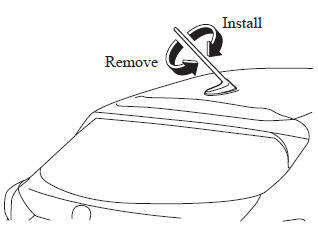 NOTE When leaving your vehicle unattended, we recommend that you remove the antenna and store it inside the vehicle. The antenna for AM/FM and satellite radio antenna receives both AM and FM signals and SiriusXM signals.